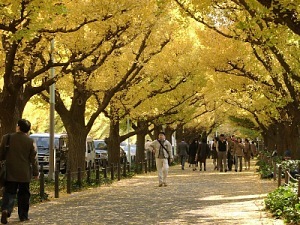 The gingko trees at Junguu Gaien is famous for it's beautiful yellow autumn leaves. The scenery should be at it's best this couple of weeks. There will be ALOT of people on the weekends, so park your bikes in the vicinity and enjoy the leaves walking through the path. This page contains all entries posted to Cycle Tokyo ! Weblog in December 2007. They are listed from oldest to newest.